Yesterday the Mr and I went on a impromptu adventure with my brother-in-law. Originally we were going to go to the zoo but his brother called us in the morning and invited us to go hiking with him. I decided to (finally) pick up a camera. Two, actually. My zero 2000 pinhole camera and my Olympus Trip. It had been a very long time since I used either one and thought I should give them both some love. The Trip I loaded with a roll of Fuji Superia and offered it up for a film swap on the Double Exposure and Film Swap Group. I’ve only used the Trip once about a year ago, and it was a very rainy day so I was a bit distracted by the rain at the time. This time I really got a chance to enjoy it. What a fantastic little camera! I kind of love that you don’t really have to worry about focusing, aside from choosing a general idea of how far away the subject is. I also love that there is a little window that you can see through the viewfinder that shows what “distance graphic” you are on. It’s such an easy and fun little camera! I want to try shooting some street photography with it. While we were at my brother-in-law’s house I was admiring his small collection of vintage cameras he had displayed on the shelf. He mentioned that he was going to sell all of them and offered to give me one as a Christmas present. 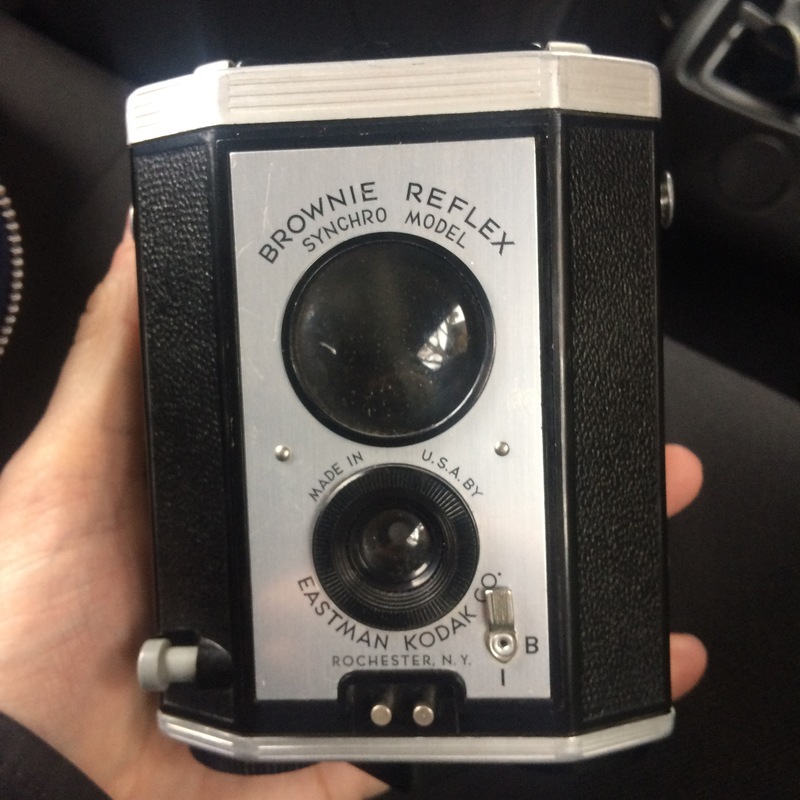 I chose this really cool little Brownie Reflex! It’s awesome! nice and compact. I even have some 127 film to load into it. I kind of also think this might make an interesting street photography camera, as well. 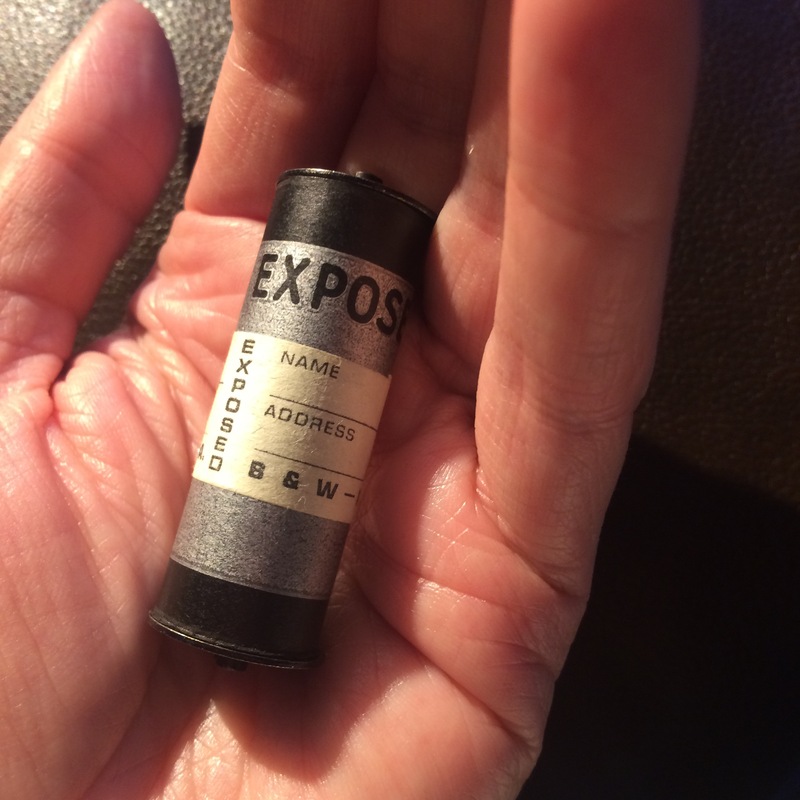 When we opened the camera up we found an ancient roll of exposed b&w film. I think I will develop it myself. I will have to resort to using my plastic reel though (ugh). We ended up going to a super secret location and hiked to a waterfall. I have been told not to disclose the location of this place because it is a secret swimming/fishing hole. It was really quite awesome though. There were two waterfalls, a bigger one and a smaller one. Here are a few photos I took on the scene. They really don’t do the place justice. Hopefully my pinhole shots are better. What a fabulous gift Moni! I bet you will have a lot of fun with it. I will try to look at your other more recent blog posts to see if you have developed that film yet. I can’t wait to see what was on it! Looking forward to it. PS I do not think it possible you are lazy. Maybe, like me, you are “creatively committed” elsewhere.